WestJet has announced the creation of WestJet Link, a new regional air service operating under a capacity purchase agreement (CPA) with Pacific Coastal Airlines. Using Pacific Coastal Airlines' aircraft painted in WS colours, WestJet Link will connect the communities of Lethbridge, Lloydminster, Medicine Hat, Cranbrook and Prince George to WestJet's network hub at the YYC Calgary International Airport. 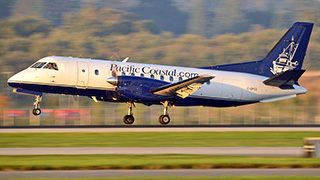 All WestJet Link flights will be operated by Pacific Coastal using its fleet of 34-seat Saab 340B aircraft. Each aircraft will include six WestJet Plus seats, giving pax advanced boarding, two free checked bags and seating at the front of the aircraft.